Welcome to my blog! These are the thoughts of a curly-tail lizard who saw the world and decided he liked his own home better. I attended a workshop recently and have decided to try my hand at poetry. I am the perfect lizard for this kind of thing. After the successful human poet inspired the attendees with his experience and wisdom, he assigned us the exercise of writing a poem we had always wanted to write. I knew instantly what I wanted to write about. I hope you enjoy it. I’ve always wanted to write a poem about iguanas. Those scaly creatures so like cats. Still you give them your warmth. But write them a poem? No! After all, nothing rhymes with iguana! This entry was posted in Uncategorized on May 20, 2018 by Elaine. When people think about deserts, they often assume the land is barren with no plant life. 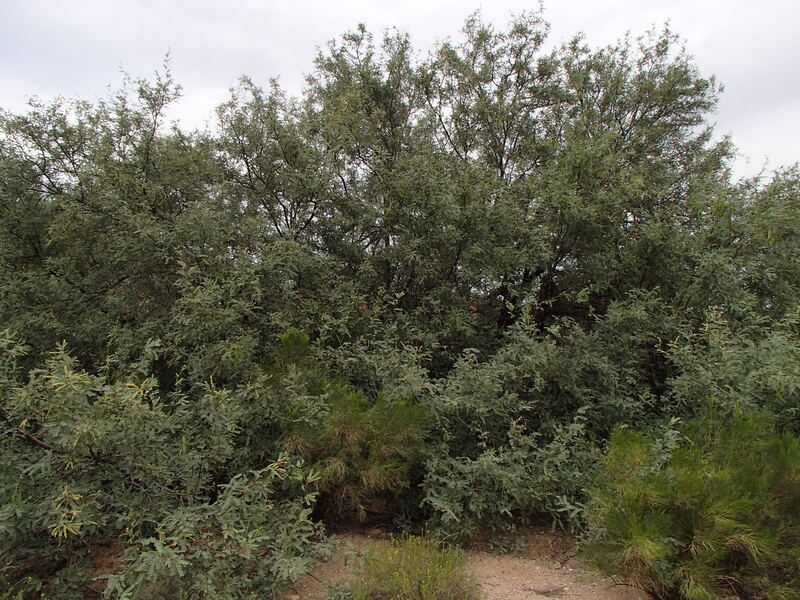 In the Sonoran desert, many plants not only grow, but thrive. I’d like to tell you about a few of my favorites. Saguaro (Carnegiea gigantean) These tree-sized, columnar cacti are the symbol of the West and are important part of the Sonoran Desert ecosystem for both animals and humans. The saguaro is the largest cactus in the United States and its crown of large white blooms is honored as Arizona’s state flower. The saguaro grows very slowly but can live a couple of centuries. They may or may not develop branches or “arms.” The roots are very shallow, extending out as far as the saguaro’s height, but the cactus is also anchored by one deep tap root. The scientific name honors Andrew Carnegie. Teddy Bear Cholla (Cylindropuntia bigelovii). From a distance, this cactus looks soft and fuzzy, but it is actually covered in a dense mass of spines. The spines, which are a form of leaf, are about an inch long, ending in a hook or barb. 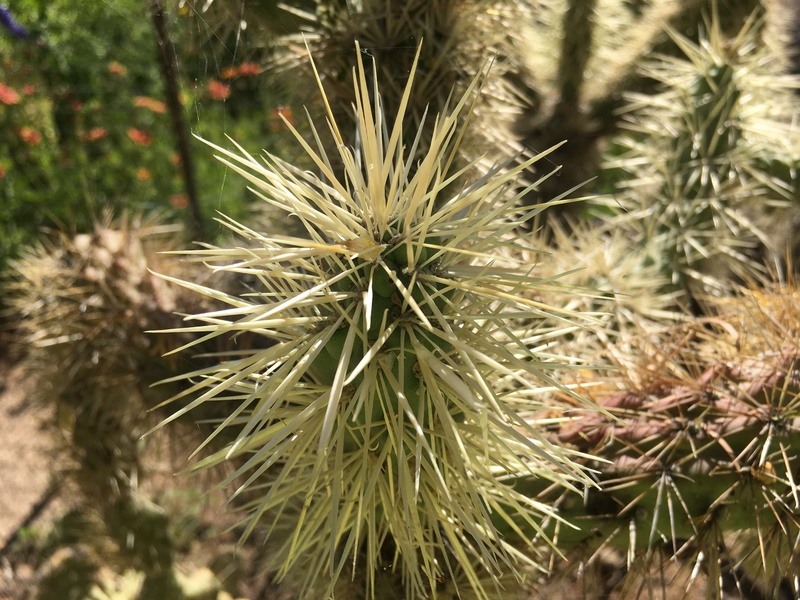 These spines so easily detach and embed in the flesh of any animal that touches it, that it is also called the Jumping Cholla, as if it can actually attack passing animals. Palo Verde, Foothills (Parkinsonia microphylla) Palo verde means green stick in Spanish. It is so named due to its green bark, which, unlike the bark of other trees, is capable of photosynthesis. The tree is also known for its spines, seed pods, and brilliant yellow flowers. Palo verdes play a vital role in the Sonoran Desert ecology, serving as the primary nurse plant for young saguaro cacti. 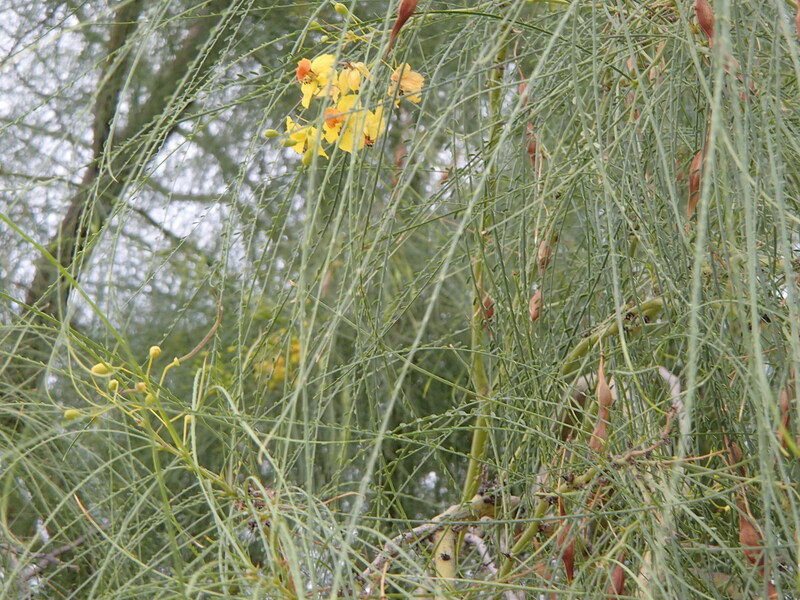 The genus name Parkinsonia honors the English botanist John Parkinson. Mesquite, Velvet (Prosopis velutina) This thorny native tree of the Sonoran Desert survives the dry climate by sinking a taproot deep into the earth. The thorns reach one inch in length. The tree is an important part of the ecosystem, providing food and protection for animals and people. Flour is made from the seed pods. The wood is popular for grilling and seasoning food, and for carving into utensils. This entry was posted in Uncategorized on April 25, 2018 by Elaine. I wanted to share some of my favorite reptiles that i find at Elaine’s house in Tucson. The Sonoran Desert has the most awesome reptiles. here are just a few. Coachwhip (Masticophis flagellum cingulum) is a slender nonvenomous snake with variable coloring to help in camouflage. In Tucson, coachwhips that are pink to red in color are called red racers. The pattern on the scales give the snake a braided look like an old-time leather coach whip. Their large eyes provide good eyesight. 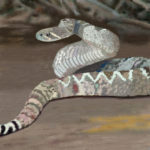 In times of trouble, they prefer to rapidly slither away (considered one of the fastest snakes) but, if cornered, they will rise up, hiss, vibrate the tip of its tail to simulate the sound of a rattlesnake, and strike quickly and repeatedly. 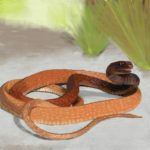 The coachwhip is associated with several Western fables. One is that the snake bites onto its own tail to form a hoop, then rolls in pursuit of its prey. Another is that a coachwhip will chase a person, coil around him, and then lash him to death with its tail. The snake checks the person for life by inserting its tail into the person’s nose. If the person isn’t dead, the snake will continue the lashing. Of course, none of these stories is true. Desert Spiny Lizard (Sceloporus magister) is a large, stocky lizard of southwestern Arizona that eats insects, arachnids, small lizards, and some plants. The overlapping gray and brown scales are pointed and keeled. The male’s body features a purple stripe near the neck. Sonoran Desert Tortoise (Gopherus morafkai) This tortoise has adapted to the extreme environment of the Sonoran Desert. The tortoise has powerful limbs covered with thick scaly skin for digging underground burrows where it spends much of its time. It eats a wide variety of plants including many that are indigestible to other animals. 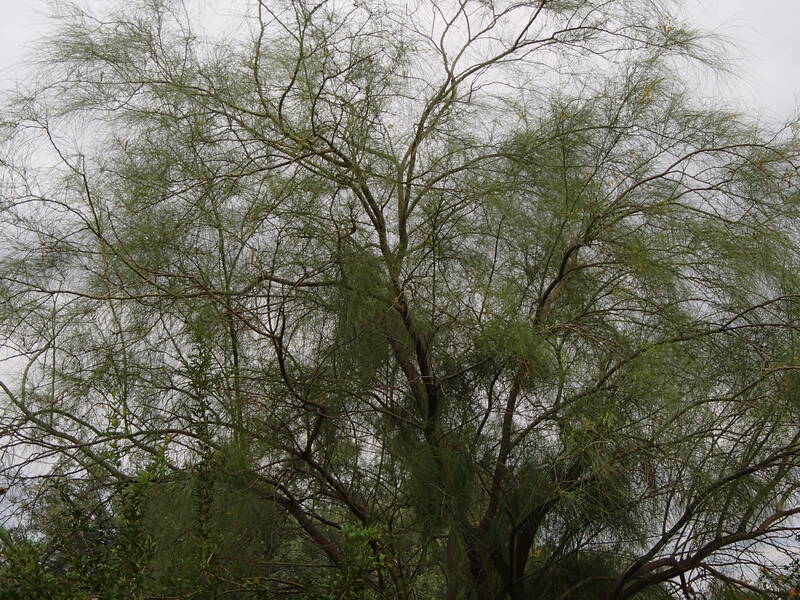 It feeds most actively during the monsoon season, and is dormant much of the rest of the year. The tortoise stores water in its bladder, allowing it to go up to a year without drinking. As a defense mechanism, the tortoise will empty its bladder to discourage a predator, like other reptiles. Unfortunately, this can deplete its water supply and result in death during a drought. 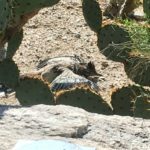 For this reason, it is important to never pick up or interfere with a desert tortoise. The gravest danger to the desert tortoises is human-caused mortality. 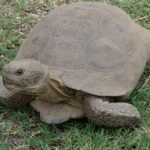 The scientific name honors Joseph Morafka for his work with tortoises. Western Diamondback Rattlesnake (Crotalus atrox) This snake is known for its distinctive rattle when threatened. The keratin rattle mechanism at the tip of the tail twitches up to 100 times per second. 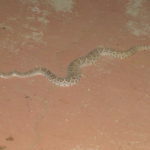 The dark diamond-shaped pattern on its back identifies this common Tucson rattler. Rattlesnakes belong to a group of venomous snakes called pit vipers, and are found in a wide range of habitats. The pits, located between the nostrils and the eyes, are used in sensing the heat of other animals, and are sensitive enough to detect a body only a fraction of a degree warmer than the ambient air. Rattlers usually hunt at night, preferring small nocturnal mammals. Rattlesnakes are important in controlling the populations of disease-carrying rodents. This entry was posted in Uncategorized on March 4, 2018 by Elaine. Hello! You know curly-tail lizards like me enjoy arid landscapes, so I’m up in Arizona exploring the Sonoran Desert. My friend Elaine wrote a book about some of the plants, animals and minerals entitled “How Not to Photograph a Hummingbird.” It’s a lot of fun. So after reading her book, I went out in search of some of the things Elaine had mentioned in her book. She has all of them in her own backyard. Today, I’m going to share some of the birds with you. I can’t share them all because she way too many, everything from small hummingbirds to birds of prey , like the Cooper’s and Harris Hawks. All are welcome. Anna’s Hummingbird (Calypte anna) This medium-sized hummingbird is found along the Pacific Coast and into the desert Southwest. It is the only hummingbird that remains in the West during the winter. 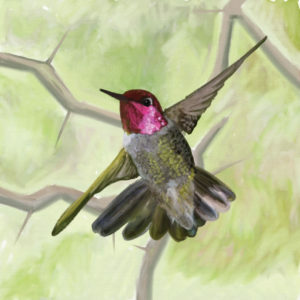 Named after Princess Anna de Belle Massena, an Anna’s is identified by its iridescent emerald feathers and bright pink gorget, or throat feathers. Gila Woodpecker (Melanerpes uropygialis) This common woodpecker in southern Arizona is often seen on Saguaro cactus. They have a distinctive horizontally barred black-and-white back with a plain brown head. The male’s head is adorned with a red crown patch. They excavate nests in saguaros and mesquite trees, and the abandoned cavities are later used by a variety of other animals. 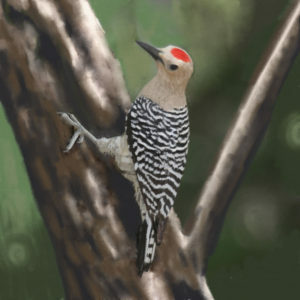 I always knew when the woodpeckers were around because of their loud, raucous call. I was watching the various birds who were gathered around Elaine’s many feeders when this incredible orange bird burst onto the scene. 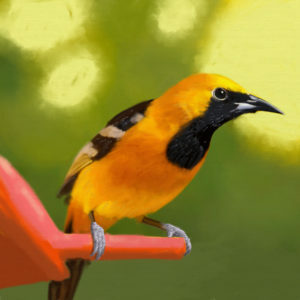 Hooded Oriole (Icterus cucullatus) These spectacularly colored orioles have yellow-orange bodies and black faces and wings. The medium-sized birds are known to drink from hummingbird feeders, even when doing so requires acrobatics. Nests are sewn to the underside of overhanging large leaves, such as palm fronds. My favorite birds are the quail. The chicks hatched at different times all summer long. They looked like little gray cotton balls with legs. Gambel’s Quail (Callipepla gambelii) These plump, ground-dwelling birds of the desert Southwest are named after William Gambel. The bluish-gray birds are easily identified by the feather plume on their heads. Quail use camouflage to avoid their many predators. The average lifespan is a year and a half. The chicks are prococial, leaving the nest to follow and feed with their parents within hours after hatching. Come to the desert. It’s filled with wonderful birds. This entry was posted in Uncategorized on February 2, 2018 by Elaine. Yes, I, Curtis Curly-tail, the perfect curly-tail lizard of the Bahamas, have my own You Tube Channel! Now, lizards of the world have a voice of their own. My friends, Elaine A. Powers and Anderson Atlas, made it possible. Elaine told me to tell you it was mostly Anderson. What will you see on my channel? Conversations with lizards, live videos of interesting nature stuff, and maybe excerpts from my books! Each episode will be an adventure. So, start viewing at https://youtu.be/PVnMdpi5cog. This entry was posted in Uncategorized on January 17, 2018 by Elaine. Could you hold on for a moment, I just want to get this shot? No, not really, but that’s what I hear people say all the time. What is it about taking photographs that people find so fascinating? Yes, I do enjoy being photographed myself. I pose on a rock so they get my good side, but then again both of my sides are good sides. I curl my tail up perfectly. That seems to be important to the person, a perfectly curled tail. But not all animals seem to enjoy being photographed. They fly or run off. But that doesn’t stop the people from pursuing them! People run or stumble across rocks, push their way through thorny bushes or dive own into water. The one I simply can’t believe is when they stand in the middle of busy roads, oblivious to the cars and trucks swerving around them. 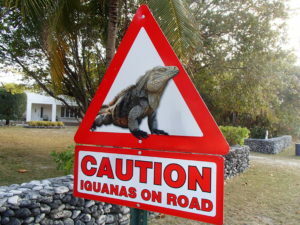 My cousins on Cayman Brac, the Lime Lizard Lads, can tell you all about avoiding cars so you don’t get squished. Most curly-tails I know run for the rocks when people approach. Actually, they run when anything that might be a predator approaches. It’s just good sense. Better to be safe than eaten. But some animals seem to enjoy playing the pursuit game with people. This seems particularly true of hummingbirds. Maybe they know their superior speed and agility will allow them to evade any human that might mean them harm. Maybe they’re a bit vain and know they’re attractive to people. Maybe they just like to play games. Spending your day sipping and flitting could get boring. Although they visit a lot of flowers and I’ve always enjoyed that. 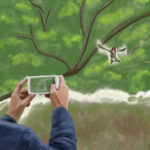 Once I’ve allowed people sufficient photos of me, I climb on a branch and watch them try to photograph a hummingbird. The hummer, that’s my nickname for hummingbirds, will fly in front of the person, flash his gorget, that’s the name of his throat feather, and hover. That excites the person. Up comes the camera and off flies the hummer. The chase is on. The hummers this way and then that. The person pursues. The hummers stops to sit on a branch, but only until the camera is raised and the button about to push, then off he flits away again. Personally, I would give up the chase after a few minutes, but the people are a determined bunch. They chase the hummer and they chase the hummer. I know that this happens both in the desert and on islands, like here in the Bahamas. Sadly, most people don’t get the photograph. I wonder, instead of searching through the lens of a camera, why don’t the people just watch the hummer and make a memory instead? This entry was posted in Uncategorized on January 14, 2018 by Elaine. Next up is my tale about being kidnapped by poachers. You’ll get to meet a few more of my native Bahamian friends. You’ll also get to meet some enemies of the plants and animals of The Bahamas. If you want to boo them while you’re reading the book, go ahead. Curtis Curly-tail is Lizardnapped deals with poaching, the illegal “taking” of plants and animals. People poach for a couple of different reasons: to collect for their personal use, like the pet trade, or for eating. You’ll meet Allison Iguana. 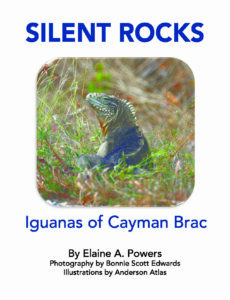 She’s an Andros Island Rock Iguana (Cyclura cychlura cychlura). Andros Rock Igs are big gorgeous lizards, with bright red heads. But, the Andros iguana is only one of 7 types of rock iguanas found in the Bahamas. Talk about an embarrassment of riches. All the iguanas are very attractive, a little on the large size for my taste being a much smaller perfect-sized curly-tail, but the humans are attracted to them. They take the iguanas home to make pets out of them. Sadly, a few end up as meals. If you want to eat an iguana stick with the green iguanas (Iguana iguana), they are being raised on ranches for food. Or head to Florida, where they don’t belong and are making pests of themselves. Greens lay lots of eggs and grow really quickly. Rock iguanas only lay a few eggs and live a long time. But back to the Bahamas: many lizards, birds, etc. are very attractive and people want to take them home with them, sort of as a reminder of their visit to the Bahamas. We, the residents of The Bahamas, would rather you come and visit us in our homes. Then when you go home, take photographs or even drawings. We’ll all be where we belong. Then there’s the consumption for food problem. Once people discover something they enjoy eating, they want to eat a lot of it. There are lots more people than there are some of Bahamian animals. We’re used to predators, it’s the circle of life and all, but you have to give us time to reproduce. Just like the hutia overgrazing the plants on Warderick Wells which will lead to their starvation, so are humans overgrazing many of the tastier animals. There’s a real danger that you’ll eat us all – then what? Oops, sorry, maybe we should have left a few? It’s bad enough with the habitat destruction, i.e. our homes being destroyed for human homes. Not to mention the introduction of predators like cats, dogs, pigs, etc. We know how to escape the predators we evolved with, but it’s not fair to imperil us with predators we have no experience with. On a happier not, I want you to meet a new human friend of mine, Jessica Minns. She, too, is a native Bahamian. Her family have been in the islands since the 1700’s. She heard about my stories and wanted to join in the fun by drawing the illustrations for this next book. Her pictures are almost as beautiful as the real animals. I know you’ll enjoy them. She, too, is from the Exumas. We’re neighbors! You should come visit us in the Exumas. Until next time – happy basking! This entry was posted in Uncategorized on February 16, 2016 by Elaine.